How to change when an email is sent out or make sure it's not sent at all. Every campaign comes with pre-loaded with email templates that have default sending delays. 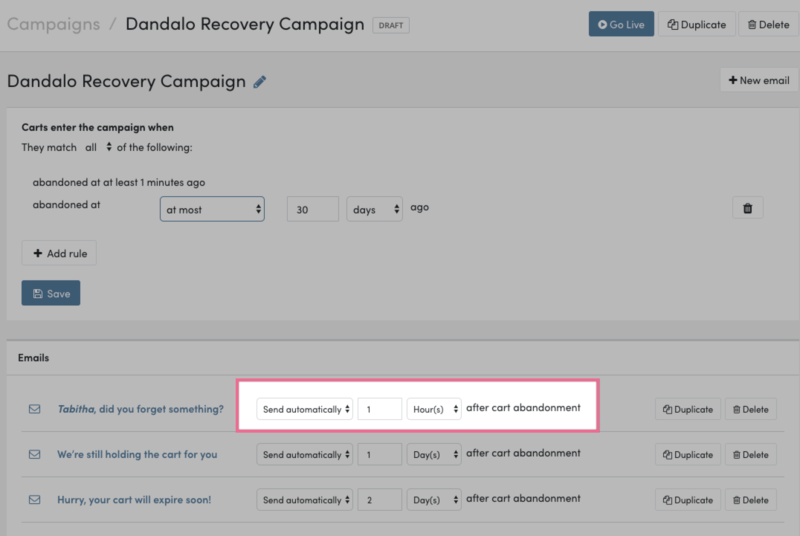 For instance, the "Cart abandoned" campaign has three emails, timed to be sent to your customers 1 hour, 1 day, and 2 days after abandonment. You may want to experiment with these timings, or even wish to stop an email from being sent at all. Follow on to learn how to make these changes in Jilt. 1. Login to your account and navigate to the Campaigns screen, then open up the campaign you'd like to adjust. Sending behavior: Whether to send the email automatically or not (ie. "Don't send"); not sending automatically basically allows you to keep this email as a "draft" until you're ready to start sending it. Delay time: Use the Minutes/Hours/Days/Months dropdown to specify the type of time delay, then make changes to the number field. Make sure to click the Save Changes button after making your adjustments. When editing an email, the bottom section of the email editor gives you control over when the email goes out, using the same Sending behavior and Delay time values discussed above. Click the Save Send Settings button when you're done and Jilt will use the new settings.